With which scene in the book of Job does this painting match up? The man on the left is full of desperation. This is Job. As tormented biblical figure he is a symbol for the suffering which can befall all mankind. With emaciated body Job sits on the ruins of his life. His meagre ribcage is visible. He tore the clothes from his body, when he heard about the death of his children. Opposite him sit his three friends: Eliphaz, Bildad and Zophar. The biblical narrative relates how they came to see Job after they had heard about the misfortune that had come over him. As true friends they came to comfort him. How does one give consolation? First of all by just being present and subsequently by giving space to the sadness and pain. Then a soothing silence follows. ‘They sat with him on the ground for seven days and seven nights, and no one spoke a word to him, for they saw that his suffering was very great.’ Silence often feels like weakness to me. This painting about Job and his friends makes me realize that in confrontation with suffering I do not always need to offer an explanation. It is okay to be silent with compassion. After the long silence Job starts lamenting his fate. Next follow the monologues of his friends who take turns in lecturing Job. They do not exactly mince their words: ‘How long will you say these things, and the words of your mouth be a great wind?,’ Bildad says. The successive sermons create an atmosphere full of reproaches and tension. At a certain point Job cries out, ‘Miserable comforters are you all. Have windy words no limit?’ This rising strain is made visible in the painting by placing the friends opposite Job and not next to him. A.W. 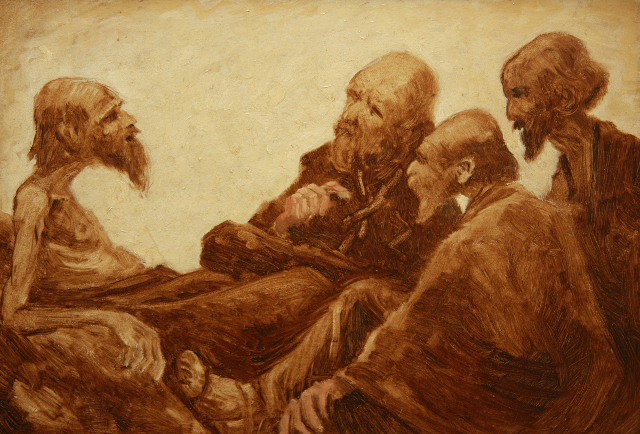 den Beer Poortugael: Job and his Friends, early 20th century, 43 x 28 cm, oil on panel. Private collection, Zwolle, The Netherlands. A.W. den Beer Poortugael (1864-1940) was a professional military, art collector and painter. In the Dutch city of Amersfoort, where he lived, he was active as regent and board member in the cultural life of the city. In 1922 he was made honorary member of the Amersfoortsche Kunstkring (Amersfoort’s Art Club). Wim Eikelboom is a journalist and lover of art. He produces radio programs for the Evangelische Omroep (Evangelical Broadcasting Company) in the Netherlands.